The sad loss of Wes Craven made me aware of how little of his filmography I had seen. Although a fan of A Nightmare on Elm Street, I was unimpressed with Last House on the Left which left me in no rush to see his other features, a fault that I intend to address. Despite this there is a huge debt that I owe to Craven and that is for making my first real experience with the horror genre a memorable one with my first viewing of Scream. Thanks to my Dad I had seen many old horror classics; Night of the Demon, Dr. Terror’s House of Horrors amongst others, but Scream was my introduction to modern horror, the slasher genre and all the fun that comes with them. The opening scene alone would shatter my thirteen year old mind and rebuild it as a horror seeker. It begins innocently enough, with Casey (Drew Barrymore) receiving a flirtatious phone call from a mysterious man who utters the infamous “what’s your favourite scary movie?”, but things quickly escalate when he asks her name because in his words “I want to know who I’m looking at”. Suddenly the big empty house, with the light reflecting off the large windows, makes the audience aware that the killer could be watching through any of them,highlighting how vulnerable Casey has become. It soon turns into a game of fatal consequences as it is revealed that her boyfriend is being held hostage and that the caller has murderous intent. 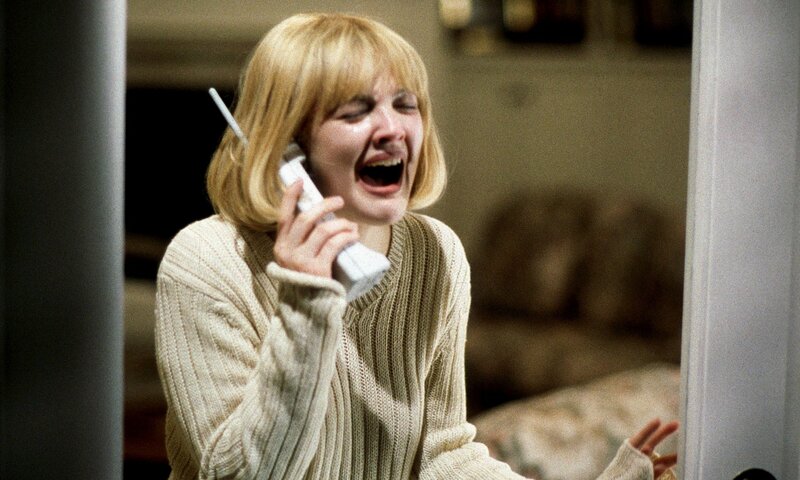 The caller finally attacking and the reveal of the scream mask is a shocking memory and I will always be glad of it. Scream works because it acknowledged the staleness of the slasher genre, so despite never having seen the films in which Michael Myers or Jason Vorhees feature they are so engrained in our culture that I was aware of their iconic costumes, blunting the initial appearance of them in Halloween and Friday the 13th when I finally saw them. This was not the case for Scream, and the connection between the mask and Munch’s The Scream isn’t something I would have cared about at the time, only how damn frightening the thing looked. I am glad to have felt this impact, similar to what the audiences of the 80’s would have felt the first time they watched the slasher classics, before the mask became well-known and worn at every Halloween party through the years. Invigorating the genre by introducing savvy characters that knew the rules of the genre also worked well in this particular scenario. Whilst it’s easy and fun to still mock them as the viewer, there is a slight nagging that maybe you may not act too dissimilar in the same situation. During the opening Casey takes a kitchen knife and goes outside rather than up the stairs but it still isn’t enough to save her, despite the glimmer of hope as she sees her parent’s car approaching. The jokiness and flirtation from earlier has long vanished, now replaced with a helpless daughter crying on the phone to her mother as she breathes her last breath. Whilst the rest of the film is good fun it never tops this opening, a scene that provided me with my first taste of visceral horror, a thrill I eagerly still chase with each new horror viewing. This entry was posted in Review and tagged 1996, courtney cox, david arguette, drew barrymore, ghostface, horror, Horror film review, horror films, scream, scream face, wes craven. Bookmark the permalink.